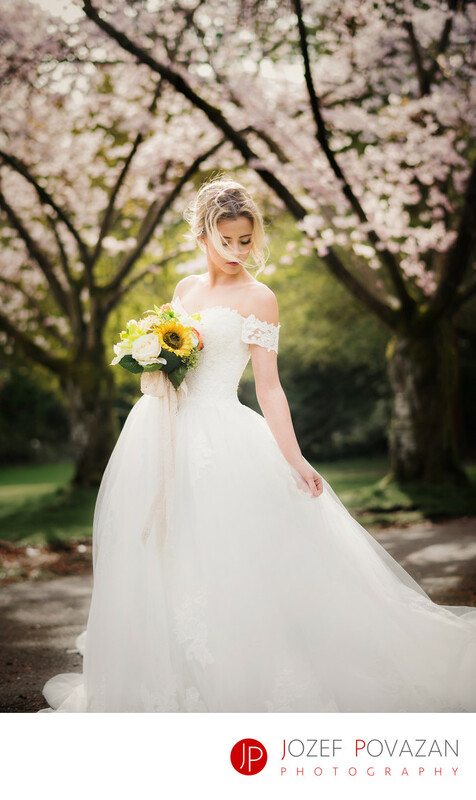 Cherry blossoms wedding bride portrait in white gown - Best Vancouver wedding photographer Jozef Povazan Photography studio. Cherry blossoms wedding bride portrait in white gown. Modern romantic look for chick brides who love soft elegant wedding pictures by Povazan Photography. Editorial styled shoot which hypnotize your senses with like film feel. Old vintage techniques combines with fresh and unique look of this century. The chrome era is back without being using film emulsion. If creative wedding story is what you love then I would like to hear from you your ideas for your wedding day. My name is Jozef and I am Vancouver wedding photographer. Location: Stanley Park, Vancouver, BC.